I have AOMEI Backupper Standard Free edition with Differential backups (DBs)scheduled to run and be verified every Friday at 6pm. I can understand a scheduled backup being run later than scheduled if the computer has not been switched on but, on two occasions, weeks apart, something has caused the schedule to run a day early and then again at the correct day and time a day later. 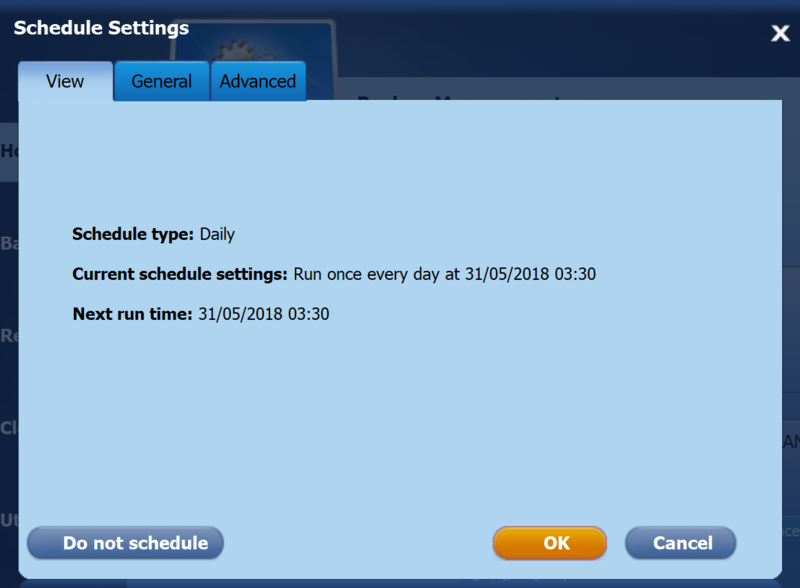 My computer clock is set correctly and stable so does anyone know what might be causing the extra DB to run out of schedule? Can you show me your scheduled backup configuration? Here are 3 pictures showing my backup configuration. Does anyone know if there is a keyboard shortcut that accidentaly triggers an unscheduled backup to happen? A day earlier means 24 hours earlier? Which means the backup ran at 6pm on Thursday? When I say a day early I do not mean that in an exact way. I think the first time it happened it was at some random time (morning or afternoon?) the day before it should have run. The second time I think it started at 6pm on the Thursday, 24 hours early. Both out of schedule. So your computer is open every Friday afternoon? Maybe your computer was off from Friday to Wednesday, so the backup ran on Thursday? I have not been away from home for any "Friday to Wednesday" periods and my computer is used every day. The most I have been away is for one night and even if this was a Friday then it would have run a backup on Saturday or Sunday when I switched the computer on again. As long as the problem doesn't get any worse then I can live with it. It has only happened twice since Backupper was installed in October 2017 and it is a simple matter to delete the extra backup. I was just curious and also thought AOMEI would be interested but if there is a solution then all the better. It is not yet clear what caused the problem, how about creating a new backup task? For now I will carry on without changes but if the issue becomes more frequent then I will create a new backup task. See picture which shows "System Backup41.adi" dated 23/02/2018 and "System Backup43.adi" dated 02/03/2018. I had deleted the extra "System Backup42.adi" dated 01/03/2018 which had been run a day early, out of schedule. I'm using Aomei Backupper for backing up huge amounts of data throughout every night. Unfortunately, the Backupper has started to disregard completely the schedules (which are all set to start between 22:00 and 05:00 , to start in the middle of the day. The big issue here is that the Backupper takes up 100% of the network speed and completely kills all apps which are connected to our server as there's 0% bandwidth left to connect or communicate with the server. This goes for tasks which are really old and tasks which I have a created quite recently. Any help is appreciated. And no, I can't create 100 new tasks. If that's the solution, I'd rather switch the application altogether. @Moose_Aomei How do you know Backupper takes up 100% of the network speed? AOMEI Backupper Schedule task service.exe has a 100% Network Usage in the task manager. Is there anything we can do about the scheduling errors? @Moose_Aomei ; Can you show me your scheduling settings? This attached one started yesterday in the middle of the day, rather than in the night. @Moose_Aomei ; I'm afraid you'll have to re-create the task to see the result.